A few weeks ago, my family biked through our frequent Sunday route in Golden Gate Park. After we had loaded the bikes on the back of the car and begun to drive away, I remembered I had wanted to stop by the Fuchsia Dell, a corner of the park I had not yet visited. We skirted the edge of the park then dropped back in a small parking lot near the main entrance. Scott and my stepson stayed in the in the car to read while my stepdaughter and I hopped out to explore the fuchsia beds. We walked wide-eyed through the glen, pointing out different remarkable flowers that hung like costume jewelry on huge bushes, often also loaded with edible berries. 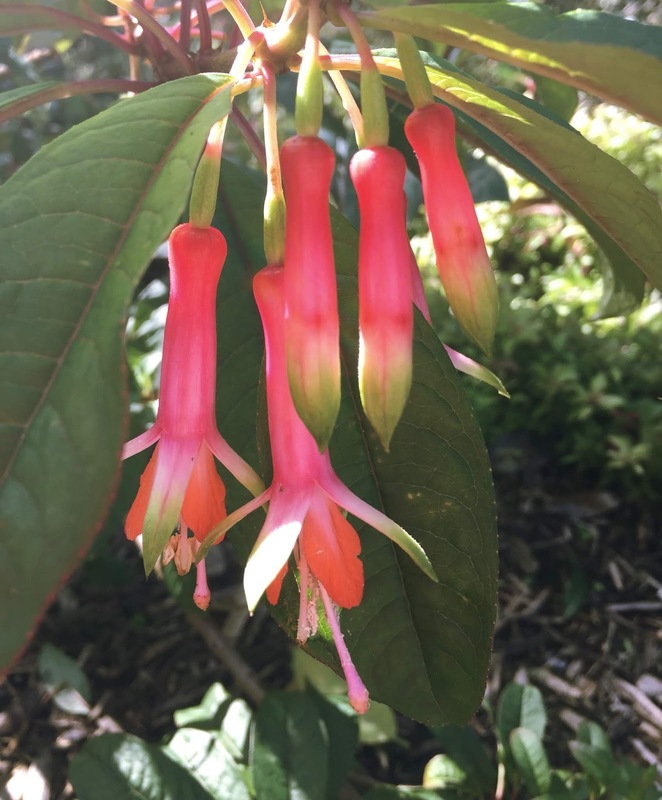 We fell most in love with Fuchsia denticulata and held the neon pink, orange, and green flowers to our ears like giant '80s earrings. 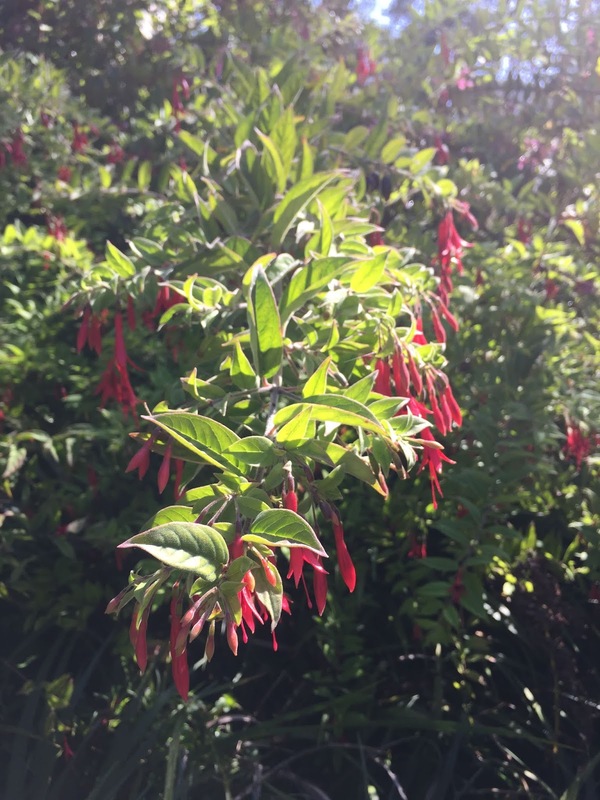 The original Fuchsia Dell was built in Golden Gate Park in the 1940s. 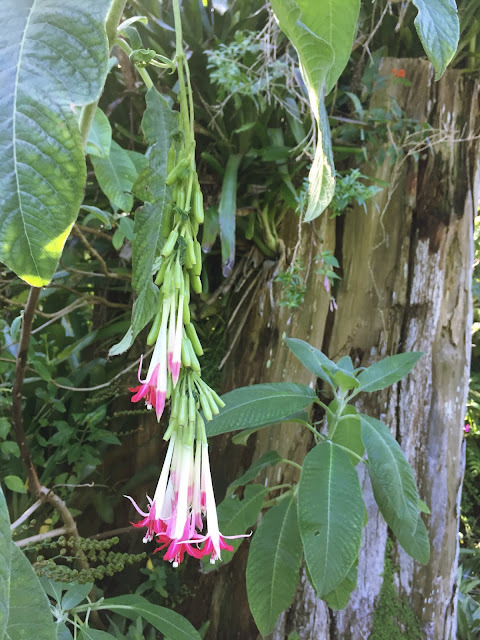 In fact, fuchsias have been in San Francisco likely since Spanish times; Pam Pierce reports that 24 varieties appeared in a flower show in 1854, just a few years after the Mexican-American War. 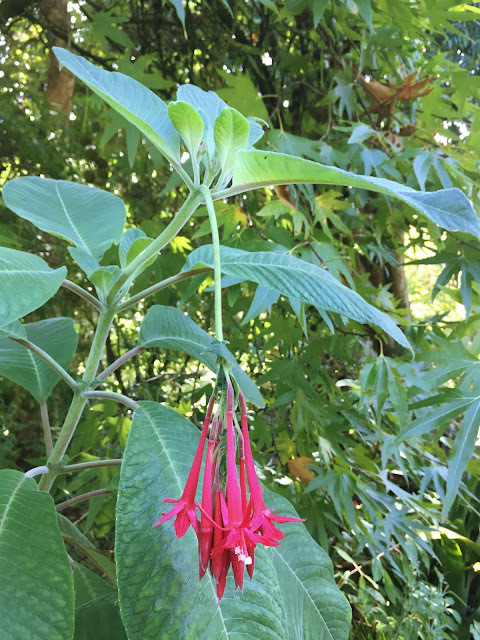 But, an invasive pest, the fuchsia gall mite, arrived in the 1980s, wiping out most of the fluffy hybrids that lived in the Dell and in the city. A friend who recently toured our neighborhood's gardens texted me a picture of another gardener's Fuchsia splendens with its coral and green tubular flowers and tasty, tangy fruit. "Get me a cutting," I replied. Too late, she had already left the garden by the time I replied. By the way, that's the way our community is—we can ask each other for cuttings without seeming rude. It's my gardening heaven. 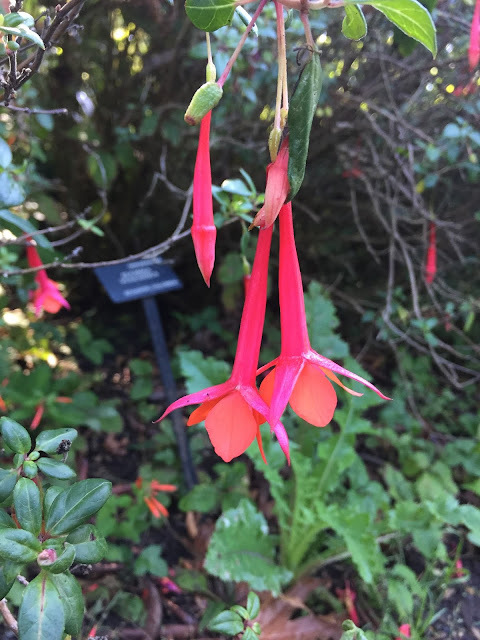 Since I have been thinking so much about fuchsias lately, when I had a half day at work yesterday, I spent the afternoon poking around another great collection in Golden Gate Park at the San Francisco Botanical Garden. The Cloud Forest gardens are loaded with species fuchsias blooming right now. Their flowers are orange and magenta, or green and carmine, or really long, or so copious I lose count before I can scan halfway along a branch. The plants are often large bushes or small trees and as loaded with berries as they are with flowers. The hummingbirds are everywhere; their buzzing wings and funny chirp-squeaks sound from every direction. Being surrounded by all this life and color is incredibly joyful. In researching more about the weird fuchsias that call to me (not the ballerinas of the genus but the modern dancers), I came across the website Fuchsias in the City. I understand this man's interest, and the depth of his research is incredible. Check out the Fuchsia Dictionary page. Amazing. To share such a resource makes an obsession admirable. At this point, I have three fuchsias in my own garden that make me happy but not satisfed: the sometimes mite resistant Gartenmeister Bonstedt; one of the first, now almost historic, mite resistant hybrids, Fanfare; and the species Fuchsia fulgens. But, I want more, especially of the funky, fruity, non-fluffy species varieties. I'm putting out an all call now. Here are species I hope to someday have in my garden: Fuchsia denticulata (I want this plant so badly), F. splendens, F. vulcanica, maybe a F. boliviana in either red or white, too. Got cuttings? I have no idea what species this is, but it is as tall and wide as a person and loaded with flowers. I want it too. Hi , I grew up in the Portola District, went to ER Taylor and St. Elizabeths. I grew up loving the fuchsias, my mom loved them and they grew great there . I live in Humboldt County now retired and growing fuchsias and lots of other things in our special coastal climate. Love your blog, happy I found it Thank you. Hello, Unknown. I'm so sorry it took me so long to respond. Welcome to this blog--I'm glad to have you here! I love the Portola District: it's the perfect San Francisco neighborhood for me. I bet you have a lovely Humboldt County garden. Here's to the soon-to-be spring! Hi Christina,Thank you for the nice welcome. Glad you like my old neighborhood, one of the best zones in Ca. for growing plants, especially fuchsias. My name is Tony, @budularo, instagram- if you want to see my Humboldt garden. Looks like it's going to be a cool one, but spring is springing. Happy Gardening.